I have an uncanny ability to spook fish. It reminds me of my uncanny ability to create a sphere of personal space when resupplying in town after a long hot stretch of trail. Yet something so pure and unspoiled it'd float washed the stink of fly-fishing failure off me. Trust me: if I can catch fish regularly, anyone can. So put away the lingering fear that the rod & reel'll be dead weight and try thru-fishing the JMT. If you're already a lightweight backpacker, trust your gut and extend your critical eye to fishing gear. Carry a four piece pack rod and leave the heavy case at home. If you gear is too expensive for you to risk damage, get yourself something you won't worry about. I went with a fly rod to make it easier to fish the shallow streams, but if you spin make sure to include a clear plastic bubble to enable the casting of flies. And seriously, if you've a passing interest in fishing but balk at adding an extra pound to your base weight, carry at least a hand line and some flies. I fished almost exclusively with the Sierra Hopper, Dave's Hopper, and the Elk Hair Caddis. The short growing season and lack of fishermen produce trout eager to take basically anything that resembles natural food. Be smart and carry more than enough hoppers and elk hair caddis to allow for the inevitable loss. Trying to cast in some of these small streams means that you'll more than likely be catching your share of bushes and trees along with the trout. I was down to a single hopper and elk hair caddis by the time I crossed Donahue Pass only 50 miles or so into my hike. Luckily, I was able to buy flies at Red's Meadow, though at a considerable markup. VVR stocks some tackle as well, though not flies. Bishop is the last place before Whitney that you'll be able to pick up more flies. 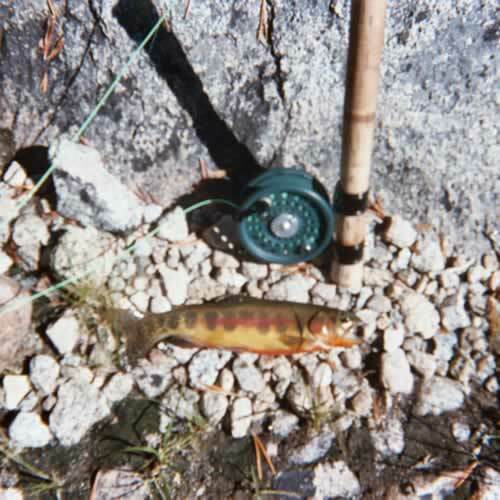 Expect to catch every fish of the sierra grand slam: brook, rainbow, brown, and golden trout. There are even rumors that it's possible to catch cutthroats in Sunrise creek. The fish are somewhat stunted and averaged between six and 10 inches, with an occasional fish reaching up to about a foot. Their incredible coloring will make you wonder if they're even distantly related to the stocked trout you may be used to catching, and will more than make up for their smallish size. The small trout are a welcome addition to a typical thru-hiker's bland food. The exceptional simmer of a canister stove allows a trout wrapped in a single layer of aluminum foil to be cooked perfectly right on the burner. Talk about easy cleanup- when you're done eating the aluminum foil can be wadded up and added to the rest of your trash. 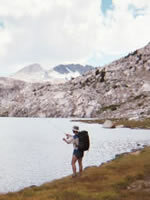 The fishing is truly spectacular on the vast majority of the JMT's waters. There's something for everyone: large to small lakes, rivers,burbling creeks, and meadows. I bought a copy of Steve Beck's Trout-Fishing the John Muir Trail before my trip to get a feel for the fishing. 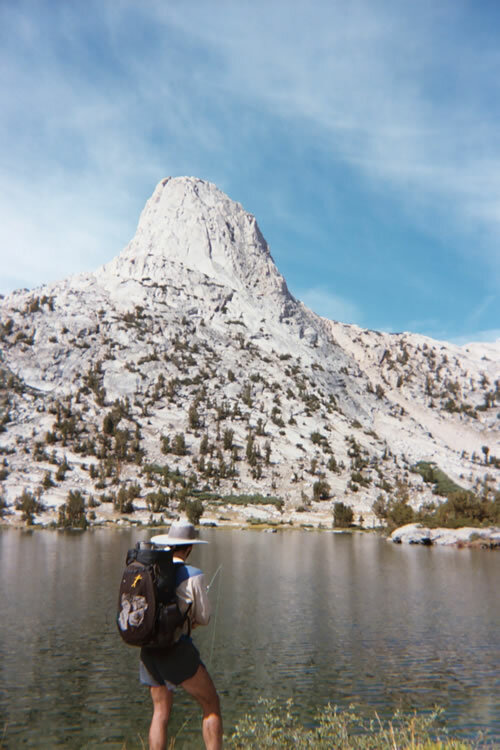 Much of the book, unfortunately, is filled with journal-like entries of his JMT trip. You could cut all the fat off this book and condense it down to one page containing a list of recommended flies (see sidebar) and another list of recommended fishing spots (see sidebar). You'll also have to suppress a bit of a chuckle at the appendix, titled Thoughts on Going Light Versus Going Heavy in which the author promotes a trad-bumbly hike complete with a 55lb pack, two rods, two reels etc. On the other hand the book is an excellent motivator if you're wondering if you should take your rod, and it's clear that while the author could stand a bit of a lesson in lightweight hiking he is an exceptional fly-fisherman. It's the kind of book you'll pull off the shelf and leaf through just for the pictures and memories it evokes of your hike. Lyell Creek: As you leave Tuolumne Meadows the trail parallels Lyell Creek, perhaps the finest trout stream I have ever fished. You can walk up this stream for some 7 miles, fishing all the way. What's more, the creek side is more or less clear of obstructions so that even the inexperienced caster will be catching fish instead of bushes and trees. Middle Fork of Deer Creek: After the moon walk to the south of Red's Meadow, don't pass up on the opportunity to spend an evening fishing this pleasant little creek. There's excellent camping just upstream of the trail crossing, and the twists and turns of the creek provide great little holes for fishing dry flies. Bear Creek: This is another opportunity to fish a stream that parallels the trail. There's a few deep holes on this one that visibly contain dozens upon dozens of beautiful golden hybrids. 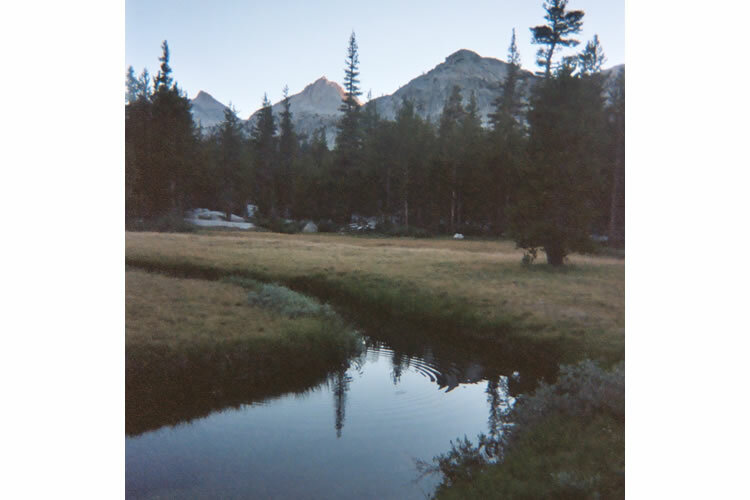 Pocket Meadow: Take a few moments to fish the alpine meadow on the day you head into VVR to resupply. This diminutive water yielded the best fish of my hike: a 13" golden caught on a #14 elk hair caddis. Practice your stealthiest creek side creep on these skittish beauties. Palisade Lakes: Golden hybrids cruise the edges of these lakes just waiting for a large meal like a Sierra Hopper. The trail parallels the shore, so you can fish and still be making time down the trail. Dollar Lake: A small lake in a beautiful setting, you'll be tempted to think "it doesn't get much better than this." Throw in above average trout fishing and you've got a recipe for a memorable stay. Lower Rae Lake: A fish on every cast will make you wonder if it's possible to *not* catch fish. Top it off with a beautiful background featuring the magnificent Fin Dome. If you're a climber, don't_pass_up the chance to climb the 4th class route up the back of Fin Dome. The old-school Sierra Club summit register lurks beneath some rocks and awaits your signature. Take the time to smell the roses during your thru-hike- those are the moments most clearly etched into your memory. Enjoy your hike to its fullest, and don't forget to bring tackle if you're at all interested in fishing!